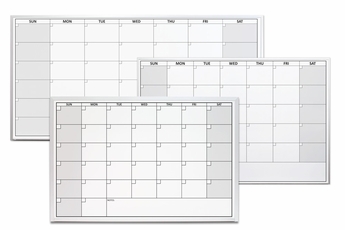 One month dry erase calendar options from OptiMA Dry Erase Products. 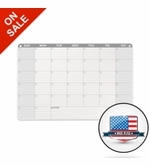 OptiMA one month calendars have a unique feature. 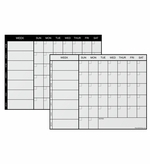 There are 37 boxes on all OptiMA one month dry erase calendars. So why is that such a big deal? It means you will always have enough room for every day of the month even those longer months with 31 days. 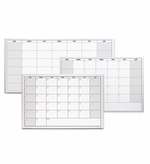 Most other dry erase calendars only have 35 days. You have to double up on the last one or two days of the month. If the month starts later in the week, there just isn't enough room. 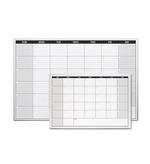 With an OptiMA 37 day calendar you never have to double up a day. 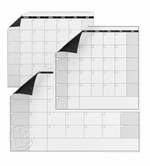 We have framed calendars, peel and stick one month decals and magnetic refrigerator calendars. Those refrigerator calendars will stick to any steel surface. 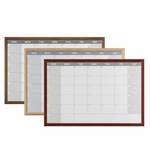 The framed calendars come magnetic receptive and non-magnetic. Magnetic receptive means you can use magnets with them. All have the exact same excellent OptiPrint™ dry erase writing surface. 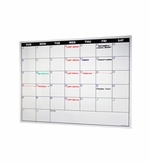 We can always create a custom one month dry erase calendar for you too. Contact a customer associate for help.